What strikes us first is Michael Perry’s baby face: big brown eyes and an Alfalfa (from “Our Gang”) haircut. He has a disarming smile that reveals big teeth that the rest of him hadn’t yet grown into. On death row for eight years, he was 28 at the time the film was made. He neither looks his age nor like a cold-blooded killer. He will be dead in eight days—killed by the state of Texas. Director Werner Herzog interviewed Michael Perry and his alleged accomplice Jason Burkett, in prison for the murder of three people. Burkett is serving a 40-year sentence and will be out in 2041. Herzog also talked to both the victims’ and the alleged murderers’ relatives and friends. He speaks in a calm, steady, and non-accusatory soft voice. You never see him, whereas Michael Moore appears in every frame in his documentaries. In some respects, the documentary reminded me of a low-key TV news-magazine crime show. There are many long shots of sparsely inhabited towns, run-down shopping malls, and fenced off grass lands, overlaid with an ominous sound track. With the inclusion of archival evidence photos, films, and interviews, Herzog appears able to piece together the chronology of the crimes. The police detective who had conducted the investigation took the filmmaker to the sites depicted in the crime-scene photos. But questions about the case still remain. According to the prosecution, Perry and his buddy, Jason, wanted a car—a red Chevy Camaro with a white hard-top—but it belonged to a friend’s, Adam Stotler’s, mother. One random day, they went to Stotler’s home in a gated community. He wasn’t home, but his mother was. Perry and Jason allegedly killed the mother as she was baking cookies (shots of drops of dough on a cookie sheet seemed to tell the story). Stotler came home in a car driven by another friend. Jason and Perry got the keys to the Camaro and made off with it and the car the other guy was driving, then killed Adam and his friend. They allegedly dumped the mother’s body, wrapped in blankets, in a lake; wounded the friend, who then ran into some heavy brush, where he died; and dumped Adam Stotler’s body as well. While on death row, Perry insisted that he was innocent. He maintained that records show he was in jail at the time of the murders, and that a cop fabricated his statements about the events. Unfortunately, the film fails to explore the lingering questions in Perry’s case. But even if he were guilty of murder, taking Perry’s life solved nothing. Furthermore, it is a fact noted by the U.S. judiciary on all levels that the death penalty is not a deterrent, as some erroneously believe. The film is not a statement about ending the death penalty. Yet the film’s content and Herzog’s interviews cause one to ask why this law is allowed to prevail. The prison chaplain’s opening monologue is given in the prison cemetery for unclaimed bodies. Plain wooden crosses bear not names, but prisoners’ numbers. He chokes up occasionally and makes a strange analogy about squirrels on a golf course and belief in an afterlife. The most effective interview was with a former prison guard who had been in charge of execution protocol ranging from escorting the death-row prisoner to the execution chamber to the subsequent removal of the body once the prisoner was pronounced dead. He had participated in over 100 deaths since the 1990s, when G. W. Bush was governor of Texas (more, now, under Perry). “It got so we were executing two a week!” he said. When he oversaw the execution of Karla Faye Tucker in 2005, the first woman to die under Texas law since 1984, he’d had enough. It affected him like no other. He resigned, giving up his pension and is now a staunch advocate for ending the death penalty; he raises the issue of who has the right to calculatedly take another persons’ life. “This is not Old Testament judgment,” he said, “An eye for an eye, “adding that Jesus would be against the death penalty. The film ends on a note of hope for Jason Burkett, who married his attorney while in prison. In her interview with Herzog, she is evasive about exactly how she got pregnant, since conjugal visits are not allowed in Texas. Perhaps the most noteworthy death sentence case is that of long-time death-row inmate and journalist Mumia Abu Jamal, who was framed for the murder of a Philadelphia cop in 1981 and sentenced a year later. On Oct. 11, the U.S. Supreme Court rejected yet another effort over a 30-year period by Philadelphia prosecutors to execute. The prosecution has about six months to decide whether or not to pursue a new sentencing hearing or drop the matter of execution and go for life imprisonment. Any more time, effort, (wo)man power, and money, not to mention adding to the toll already taken on Jamal and others who have spent decades in a death-row cell deprived of human contact, could end with a federal and state repeal of this inhumane law. Two staunch anti-death penalty advocates, U.S. citizen Sonia Jacobs and Peter Pringle of Ireland, have recently been released from prison after spending half their lives in a death row cell—Sonia, on appeal, and Pringle totally exonerated. They have been touring both countries lecturing and touting their recently published books about their ordeal. It is a fact that many innocent people are put to death in prisons in the 34 states where the death penalty is enforced. Recently, Gov. Kitzhaber of Oregon has said that he will now block all executions. We must demand that the other states, the U.S. military, and federal government now end the death penalty for good. 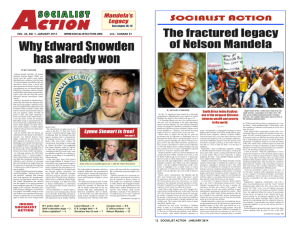 > The article above was written by Gaetana Caldwell-Smith, and first appeared in the print edition of the December 2011 issue of Socialist Action newspaper. November 30, 2011 in Arts & Culture.